Garrett Dickerson dives into the end zone. The senior superback caught two touchdown passes against Minnesota. Facing a lackluster Minnesota team, Northwestern made sure its seniors went out with a bang. The No. 23 Wildcats (8-3, 6-2 Big Ten) ran over, around and through the Golden Gophers (5-6, 2-6) on Saturday, rolling past Minnesota 39-0. 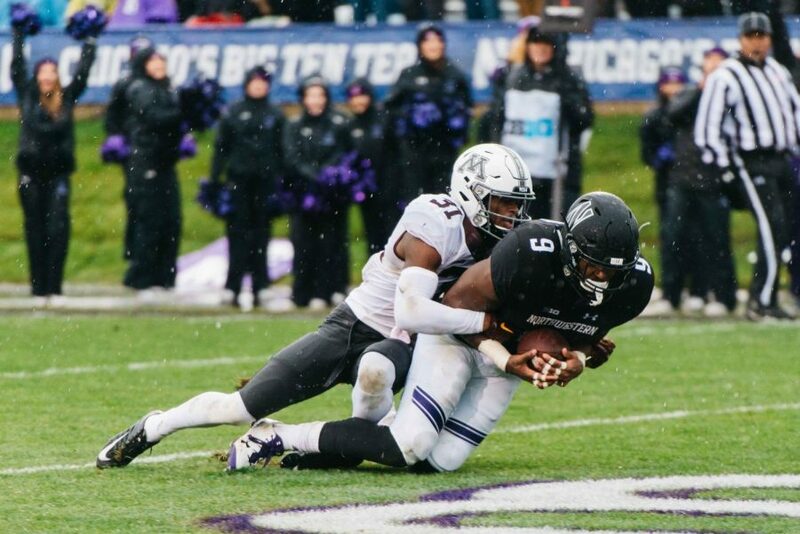 Senior running back Justin Jackson provided nearly half of NU’s offensive yardage, turning in an impressive 166 rushing yards — including 136 in the first half — in his Ryan Field finale. NU pushed its win streak to six games, its longest single-season win streak since 1996, when the Cats shared a Big Ten title with Ohio State. Heavy winds and precipitation progressed from rain to sleet to snow throughout the afternoon, forcing the hosts to lean on a ground-and-pound attack. Ten Wildcats combined for 277 rushing yards on 55 attempts, including senior Corey Acker and senior walk-on Chad Hanaoka, who received their first carries of the season, and junior Alex Bousky, who toted the rock for the first time in his career. The combination of weather and dominant run game allowed junior quarterback Clayton Thorson to take a backseat. Thorson tied his career high with three touchdown passes, but finished with just 86 yards on 13 attempts. Minnesota, however, couldn’t get anything going against the NU defense. Golden Gophers quarterback Demry Croft completed his first two pass attempts of the day for 43 yards and then went 0-for-9 the rest of the way. The Minnesota running game fared a bit better, though. Rodney Smith racked up 96 yards on 18 carries and Kobe McCrary added 69 yards on 10 rushes. But five turnovers ultimately sealed Minnesota’s goose egg. The Cats will wrap up their season in Champaign next week when they face Illinois in the annual battle for the Land of Lincoln trophy. NU has won the last two meetings and four of the previous five. After that, the Cats are bowling. And if Saturday was any indication, they are well-prepared for almost any opponent.